Dennis McField, spelled Dennis Mackfield in the Japanese version, is a character in the Yu-Gi-Oh! ARC-V anime. He is an exchange student from the Leo Institute of Dueling School for the Performing Arts (Broadway campus in the Japanese version) and belongs to the Xyz Summon course. In reality he is associated with the Duel Academy from the Fusion Dimension. He is a former member of the Lancers. Full body view of Dennis. Dennis in a Turbo Dueling outfit. Dennis has bright curly red hair hanging down to his chin in crumpled spikes, green eyes, and a beauty mark below his right eye. He wears an odd ensemble of clothes, a long-sleeved blue collared shirt with a purple bow tie around his neck, and an orange jacket on top of that missing the right sleeve and with a shortened hang on the right side, as well as a black glove on his left hand, and dark pants and red shoes. His unique clothing with two different sides possibly foreshadows his actual task as a double agent, working for both the Lancers and the Academy. He keeps his Duel Academy pin hidden under his collar. During Turbo Duels, Dennis wears an orange and grey jumpsuit with a maroon helmet. Dennis is described as a well-rounded and charismatic individual with a sense of humor, yet can also be serious at times. As an admirer of Yusho Sakaki he runs a Deck that seems to mirror his and Duels as a Dueltainer, thus he is often flashy and enjoys performing acrobatics. When excited he seems to be rather air-headed and tends to forget about anything else at the moment, as seen when he wanted to talk to Yuya since he is the son of Yusho and enjoyed his Dueling, only to be interrupted in the still ongoing Duel by the Bandit Warrior Academy students' offensive, forcing him to block their attempts at damage while showing comical frustration at their interference. This doesn't, however, prevent him from being distracted when he spots the Obelisk Force while attempting to make a move in his Duel against Celina. Despite his penchant to gather attention to himself as an entertainer, he does not seem to mind sharing the spotlight since he took the opposing attacks himself in favor of Yuya doing the honors, believing him more adequate for "the finale". This sense of modesty is also seen after his defeat against Shay Obsidian, where he admits that Shay won. After he is revealed to be associated with Duel Academy, his personality remains largely the same, unlike Sora Perse. Dennis demonstrates a degree of regret when Halil and Olga encountered him and Yuri, as he knows what Yuri will likely do to them, but at the same time, makes no move to stop him or the Obelisk Force. He pragmatically avoids his identity being compromised during the Battle Royal and internally panics when he thinks that Declan Akaba has found him out. Despite this he was still willing to work with the Lancers in stopping Duel Academy, possibly in order to keep his cover. Dennis truly enjoys being an entertainer, and seems to like spending time with his fellow Lancers. Nevertheless, he is loyal to his dimension's cause and despite knowing the consequences, he green-lit the Invasion of the Xyz Dimension after discovering Lulu. Despite this, he can be just as cruel and sadistic as several Duel Academy agents, vowing to destroy Shay slowly before his second Duel with him began. He showed noticeable annoyance and anger at Shay for "taking off his mask" as the Duel progressed, and after being forced into a corner, Dennis reveals his true colors and his usual cheerful tone becomes more maniacal while declaring it a "Hunting Game". After his final defeat, he is approached by Yusho, who says that his Duel brought a lot of smiles, and he can bring more if he rejoins the Lancers. Dennis, feeling guilty for his betrayal against the Lancers, refused. 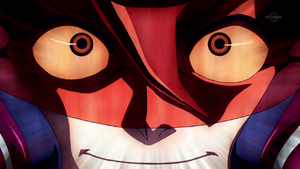 But he is still a good loser, fulfilling Kite's demand as well as Rin's location. As per his loss, he cannot return to the Professor, and carries out one last thrilling show by sealing himself into a card. 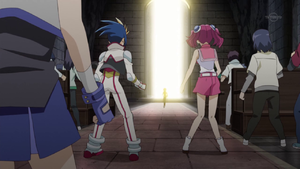 Dennis was sent to the Xyz Dimension prior to Duel Academy's invasion. There he posed as a resident of Heartland City and often gathered large crowds of people while entertaining as a street performer. At some point while in Heartland, he saw Yusho Sakaki performing and his desire to become a Dueltainer awoke, to the point where he even become one of his students. During one such event, he spotted Lulu Obsidian in the crowd. Knowing she was one of Duel Academy's targets, he used his "Performage Trapeze Magician" to draw her away from the crowd and the two became friends. Though he regretted having to abandon his street performances he nonetheless contacted Duel Academy to green-light the invasion of Heartland. After the invasion commenced, Dennis learned the location of the Resistance's base and called in Yuri. He pointed out who Lulu was before retreating, thus allowing Yuri to Duel and capture her. Dennis and "Performage Trapeze Magician". Dennis made it through the preliminary rounds of the Arc League Championship, getting into the Top 16. He joined 14 of the other contestants (minus Shay Obsidian) in the Stadium for the announcement of the Battle Royal section of the tournament, where they were told that they would need to collect Pendulum Monsters to progress. Dennis ended up in the Volcano area, and he saved Yuya Sakaki, the son of Dennis's idol Yusho Sakaki, from defeat by Bandit Warrior Academy students Nagi and Taka with his "Performage Damage Juggler". But Dennis's interference cost him 2000 LP, but he continued to support Yuya, saving him from the continued attempts at damage by Nagi and Taka's monsters. Unconcerned with the situation, he explained his history to Yuya and his admiration of Yusho. When it came to Yuya's turn again, Dennis encouraged him to perform the finale, and he successfully calmed Yuya down after Yuya was worried that he was exhibiting the same symptoms that he did in his Duel against Iggy Arlo. Dennis used his "Performage Trapeze Magician" to support "Dark Rebellion Xyz Dragon" and the two of them won the Duel. After parting ways with Yuya, Dennis encountered Zuzu Boyle and cornered her into having a Duel with him. He told her he wanted to become a Dueltainer like Yusho Sakaki, and she accepted, interested to see how he Dueled. He ultimately defeated her by turning her own "Bloom Diva the Melodious Choir" against her, and she gave him two Pendulum Monsters as per the rules. He wished her luck on making it through the tournament so they could Duel again, but then Celina showed up and challenged him to a Duel, and he was surprised to see that she and Zuzu looked the same. Celina accused him of being a remnant from the Xyz Dimension, which he denied, but nonetheless accepted her challenge, despite Zuzu's protests that they were in the middle of a tournament. He acknowledged that Celina was mistaken about something, but adapting to situations like this was part of Dueltaining. He quickly Summoned two Level 4 monsters, setting himself up to Xyz Summon, but then realized that an Xyz Summon would just confuse Celina even more, and instead played "Bubble Barrier" to protect his monsters. This ultimately failed, as Celina was still able to destroy both of his monsters and damage him significantly in her next turn. Dennis then decided to play seriously, and drew his next card, but was horrified to see that it was "Polymerization". Realizing he couldn't win, he merely Set a monster and another card, which prompted Celina to accuse him of underestimating her. He tried to protest, but Celina refused to hear of it. Celina managed to switch Dennis' Set monster to Attack Position, meaning that another attack would cause him to lose; he was about to activate his face-down card in response, but then he saw Obelisk Force arriving, which distracted him long enough for the attack to land, ending the Duel. Dennis showing Yuri his next target. Despite being defeated, Dennis somehow still managed to locate and eavesdrop on Celina and Zuzu after the two had been taken to the Arctic Zone by Celina's bodyguards. Listening in on Zuzu and Celina's conversation he managed to discover Zuzu's plan to swap clothes with Celina so that Celina could locate Shay undetected by the Obelisk Force. Contemplating what do with this information, Yuri appeared before Dennis who had been waiting for him, revealing his true affiliation with Duel Academy. Dennis informed Yuri that Zuzu and Celina have swapped clothes before he went to the Jungle Area where Yuya and the others were. There, he informed Yuya where Zuzu was. However, when they arrived, Zuzu was gone, so Dennis came to the conclusion that Yuri had successfully captured Zuzu. He later separated from Yuya and Gong Strong, leading the Obelisk Force to Celina, but not assisting him due to wanting to preserve his cover, and noting the arrival of Reed Pepper and Trout. When the Battle Royal ended, Dennis kept Aura safe and claimed when Yuya asked that he'd searched for Zuzu, but only found Aura. Declan Akaba arrived and informed the group that he had seen their Duels, and Sylvio Sawatari revealed that the Battle Royal had been to select the Lancers. Dennis was planning to take Celina back with him to Duel Academy after events had quieted down, but was unable to when she revealed to the rest of the Lancers that she was from Duel Academy. He watched the subsequent Duel between Yuya and Declan. He was both impressed and shocked to learn of Declan's skills in Summoning techniques, informed by Gong, Sylvio and Yuya of the extent of Declan's skill. 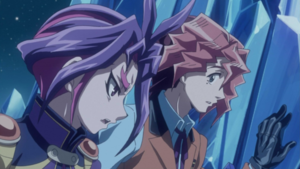 He was surprised when he heard Yuya claim that Zuzu must have been sealed in a card, wondering if that meant that Yuri had failed and that she'd been captured by the Obelisk Force. When Declan claimed that Zuzu could be alive, Dennis panicked, wondering if his identity had been compromised. He was present the next day at Leo Corporation, where the Lancers were informed that they would be going to the Synchro Dimension to recruit allies in the fight against Duel Academy. When Celina deduced that Zuzu was actually in the Synchro Dimension, Dennis panicked again since this meant that Yuri had failed. They departed with their Duel Disks upgraded to travel between dimensions and project an Action Field. After arriving in the Synchro Dimension, Dennis and Gong were separated from the other Lancers. Dennis came up with the idea to entertain people with a magic show, which resulted in him making a good deal of money. After seeing Melissa Trail, Dennis saw it as the opportunity to find Yuya by Dueling Gong and setting the Duel up as hero vs. villain. At first, Dennis tried to set up Gong as the villain, but Gong opposed it and due to his Synchro Summon, he was seen as a hero. Dennis then wore a mask and acted as a villain. He managed to use both Pendulum and Xyz Summoning to entice the audience and Lucas Swank. After Gong won the Duel and Dennis was collecting his donations, Lucas appeared before both Dennis and Gong and offered them an opportunity to meet strong Duelists. Dennis in a Turbo Duel against Shay. As they reached the entrance to the location Lucas had described, Gong began to express his doubts, and Dennis had to convince and remind Gong why they were following Lucas. Lucas then dragged both Dennis and Gong into the elevator and took them to the Underground Dueling Arena. There, they both saw Shay Turbo Dueling and defeating Hunter Pace. After talking with Shay and learning that he was looking for strong Duelists, they both learned that Shay was Dueling to enter the Friendship Cup and then Duel Jack Atlas. After Shay insulted Dennis' Xyz skills from LID, Dennis retaliated by insulting Shay's Xyz Monsters. 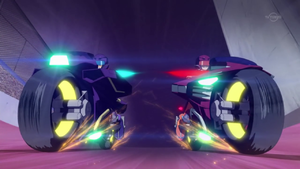 This allowed Dennis to challenge Shay to a Turbo Duel to see who was better after Dennis learned what they were. At the beginning of the Duel, Shay was handicapped with 1000 LP while Dennis started with the standard 4000. Shay immediately set the pace by reducing Dennis' LP to 2400, but Dennis countered and reduced Shay's LP to 100 with "Trapeze Magician". Shay began to question the validity of Dennis attending LID and then lowered his LP to 100 as well. Dennis then countered by Pendulum Summoning two "Performage Wing Sandwichman" and "Performage Ball Balancer" to the field. This once again left the audience in awe. Dennis performed a Pendulum-Xyz Summon to bring out "Performage Shadow Maker" and destroyed "Blaze Falcon", but Shay nullified the damage and brought out "Raidraptor - Revolution Falcon" using "Shadow Maker" as the Xyz Material. Dennis was able to climb back into the Duel by using the effect of the targeted "Shadow Maker" to Summon another, but at that moment, Sector Security interrupted the Duel and shut down their Duel Runners, causing Dennis to crash. He was quickly surrounded and arrested. Dennis, Gong and Shay were all sent to the Facility. Shay was sent to solitary confinement on the first day, leaving just Dennis, Gong, and two other inmates in their shared cell. After Gong bribed a guard into preventing the inmates from being bullied, Dennis used his cards to bribe the dinner server to ensure that the inmates got enough to eat. Yuya, Sylvio, and two Commons, Crow Hogan and Shinji Weber, arrived in their cell on the next day, and Dennis explained their capture to Yuya. He later joined Gong in urging the group to calm down after being bullied. Dennis was present during Yuya's Duel against Chojiro Tokumatsu, the "boss" of the prisoners, and expressed shock at Chojiro's tactics. After Yuya's victory against Chojiro and Chojiro's return to his previous outlook, an Dueltaining tournament was organized in the Facility, but in reality it was being used as a cover by Crow, Shinji, and new inmate Damon Lopez for an escape. When Dennis learned of the plan, he aided in the escape by going to rescue Celina from solitary. He alerted the other Lancers of the success of their escape after they defeated the Stomptroopers and they attempted to swim from the Facility island. However, they were re-arrested, this time personally by Sector Security Director Jean-Michel Roget. Envoys of the High Council intervened on Declan's behalf, and the Lancers were inducted into the Friendship Cup to prove their strength to the Council. Dennis was moved to a penthouse for the duration of the Friendship Cup. He watched the Duels of the first day of the Cup and displayed concern for his fellow Lancers and Zuzu as they Dueled. He was mildly disappointed that he didn't get to Duel on the first day, but resolved to entertain the crowd the following day. He and Shay were chosen as the participants for the final Duel in the Cup's first round. After performing a magic trick from his Duel Runner and arriving at the starting line, Dennis commented on how they would have to put up a good Duel despite being friends. Shay responded critically, having his suspicions about Dennis' true identity. The two reenacted much of their previous Duel in the Underground Duel Arena, with Shay summoning "Raidraptor - Fiend Eagle" again and Dennis bringing out his "Performage Trapeze Magician" and "Performage Shadow Maker" once more. Dennis attempted a FTK with the former monster and three copies of the latter, but failed due to Shay's "Rank-Up-Magic Doom Double Force", which Dennis predicted was "Raid Force" instead, and the subsequent summon of "Revolution Falcon". Dennis is forced to reveal his hand. Dennis tried his best in protecting his "Trapeze Magician" from Shay's assault by sacrificing all three of his "Shadow Makers" with "Battle Change" and "Performage Magic Tactician", but he failed, leaving him with no monsters on the field. Shay's "Raidraptor - Target Flag" also forced Dennis to reveal his hand, and "Polymerization" was the only card there. Confirming Shay's suspicions, Dennis drew and activated "Chaos Ancient Gear Fusion", using the defeated "Performage" Xyz Monsters to Summon "Ancient Gear Hunting Hound" and its three chimeric Fusion versions, and fused them into "Chaos Ancient Gear Giant". Shay remembered that monster from the invasion of his dimension. Dennis then declared the start of a new hunting game, confirming his Duel Academy roots. "Chaos Giant" rendered Shay's combination of "Raidraptor - Lock Chain" and "Raidraptor - Reactor" useless, but he was able to survive the attack of "Chaos Giant" with "Raidraptor - Last Strix". Regardless, the attack on "Revolution Falcon" laid waste to the arena, debris being thrown everywhere. Dennis then revealed to Shay how he was involved in Lulu's kidnapping and green-lit the invasion. Enraged, Shay counterattacked by using "Rank-Up-Magic Soul Shave Force" to Summon "Raidraptor - Satellite Cannon Falcon". This monster reduced the ATK of "Chaos Giant" to 500. Dennis attempted to survive using Action Cards, but the debris from the attack of his own "Chaos Giant" tripped up his Duel Runner and he was unable to and was thus defeated by "Satellite Cannon Falcon". After the Duel, Dennis admitted that Shay had won before passing out. Still filled with rage, Shay tried to seal Dennis in a card but was unable to do so due to his modified Disk, so instead he attempted to punch Dennis but was stopped by the tournament's staff, who then carried Dennis off on a stretcher. Dennis being returned to the Fusion Dimension by Sora. Dennis was being taken to the recovery room when High Council and Sector Security both attempted to take him into custody. Sora Perse saved him and took him away to an alleyway. Sora then revealed his mission to bring Celina back to Duel Academy and sent Dennis back to the Fusion Dimension. Barrett later mentioned to Yuya that he knew that Zuzu was in the Synchro Dimension thanks to Dennis, confirming to Yuya that Dennis had indeed been a spy for Duel Academy. Dennis approached Iggy Arlo, informing him that if he wanted to defeat Yuya, he should come to the Fusion Dimension, as Yuya would eventually show up there. Dennis arriving at You Show Duel School. Dennis managed to find Yusho Sakaki at the Fusion Dimension's You Show Duel School through eyewitness reports, where the students were preparing to attack Duel Academy. Having brought several Duel Academy soldiers with him, Dennis warned them they would never reach Duel Academy, asking Zuzu to come with him and recognizing Yugo from the Friendship Cup. Dennis challenged Yusho to a Duel to see if he had surpassed him. On his first turn, Yusho only Set a card, angering Dennis, who told Yusho he had learned new things from being all over the place. He Pendulum-Xyz Summoned "Performage Trapeze Magician" and used its effect to attack Yusho twice. However, Yusho activated "Miraculous Hats", hiding himself under one of the hats. Dennis destroyed both but under the hats were "Wonder Balloons" and "Paper Doll" - and while Dennis and his soldiers had been distracted, Yusho and everyone else had fled. Dennis had his soldiers go to the harbor to prevent them from reaching Duel Academy, and they cornered Zuzu and Yugo. Yuya, Gong, Sylvio, and Kite Tenjo arrived, causing Yugo to vanish, and though Dennis was surprised at seeing Yuya again, he told Iggy, who was in the jeep with him, that it was his turn now. When the Lancers spotted Dennis, he brought out more Duel Academy soldiers to capture Zuzu and left to pursue Yusho, unaware that Kite was on his tail. Dennis sealing himself into a card after being defeated. Dennis managed to catch up to Yusho and Alexis Rhodes just as they arrived on the ship and cast off. Dennis once again challenged Yusho to a Duel, but Kite interrupted them and challenged him to a Duel in Yusho's stead. Recognizing him as Shay's ally and Yusho's student, Dennis accepted the challenge. 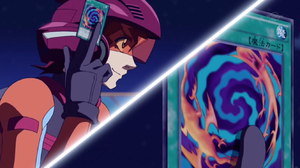 Dennis started his turn by summoning "Performage Trapeze Magician", and Kite responded by Summoning his ace monster, "Galaxy-Eyes Cipher Dragon". 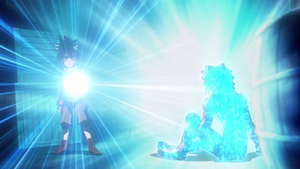 Kite used the effect of "Cipher Dragon" to try to defeat Dennis in one attack, but Dennis Summoned "Performage String Figure" to negate the battle damage. He then Fusion Summoned "Performage Trapeze Witch" and used it together with "Trapeze Magician" in retaliation to try to destroy "Cipher Dragon", but Kite saved himself and his monster with "Cipher Deterrent" and hung on with 200 LP. To Dennis' surprise, however, Kite Summoned "Little Fairy", a monster that Dennis didn't expect to be in Kite's Deck. Using it and "Rank-Up-Magic Cipher Ascension", Kite Summoned "Neo Galaxy-Eyes Cipher Dragon" and defeated Dennis with it. Yusho applauded Dennis' performance and tried to convince him to join them, but Dennis refused. He admitted that the times he spent with the Lancers were fun and he truly enjoyed the Dueltaining he did until now. However, since he had already betrayed the Lancers, he felt he didn't have any right to return to them. He also revealed where Lulu and Rin were held captive. 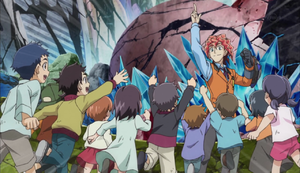 Feeling that there was no turning back after revealing the Professor's "greatest secret", Dennis jumped from the ship and sealed himself into a card, much to the shock and dismay of Kite, Yusho, and Alexis. His card was carried by the wind into Yusho's possession. Following the battle against Zarc, Dennis was freed from his card and appeared before Yuya, who was traveling through the dimensional corridor gate, in the Xyz Dimension. He told Yuya that he would be his opponent instead of Shay, who had gone to the Fusion Dimension to save Lulu. Yuya prepared to follow him, but Dennis stopped him since he still wanted to Duel and revealed that he was one of Yusho's students. He told Yuya he could go if he won and pointed out the spectators, causing Yuya to accept the challenge. The parents of the watching children didn't want them to watch the Duel, so Dennis revealed his "Polymerization" card and threatened to seal them back into cards if they didn't watch. He Fusion Summoned "Performage Trapeze Witch" and equipped "Ancient Gear Mask" it, using the combined effects of "Trapeze Witch" and "Ancient Gear Mask" to weaken and destroy "Odd-Eyes Pendulum Dragon" and prevent Yuya from using Spell or Trap Cards. Dennis agreeing to teach Dueltaining to children of Heartland. Yuya Pendulum Summoned "Odd-Eyes" back and he was able to combine it with "Performapal Miracle Mirrorabbit" to destroy "Trapeze Witch". Yuya urged Dennis to cast aside his villainous persona, announce that he crossed dimensions to give an amazing Dueltainment. Dennis gave in, and Xyz Summoned "Performage Trapeze Magician". He attacked multiple times with the effect of "Trapeze Magician", but Yuya used Action Cards to save his monsters, destroying "Trapeze Magician". 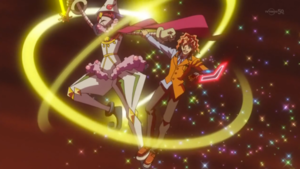 However, Dennis used "Rank-Up-Magic Magical Force" to Rank-Up "Trapeze Magician" into "Performage Trapeze High Magician", using its effect to attack three times, but Yuya survived with the Pendulum Effect of" "Performage Bubble Gardna". On the next turn, Yuya revived his monsters again and used the effect of "Performapal Sword Fish" to lower the ATK of "Trapeze High Magician". Dennis used its effect again to prevent its from destruction up to thrice per turn and climbed up Heartland Tower. However, Dennis was defeated when Yuya attacked "Trapeze High Magician" repeatedly using "Challenge Stairs", "Hope Stairs", his Monster effects, and "Miarcle" until it was destroyed. 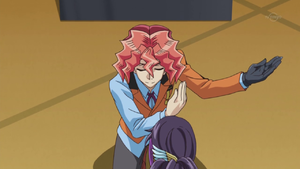 He fell from the tower but Yuya caught him, and both of them responded to their applauding spectators. The kids all wanted Yuya to teach them Dueltaining, and he promised them that Dennis would be their teacher. Dennis happily accepted the responsibility, and he mentally thanked Yuya as he left for the Fusion Dimension. He is later seen watching Yuya's Duel against Jack with the children, telling Yuya to show them the greatest Dueltainment. Dennis cheered Yuya on when he brought out "Dark Rebellion Xyz Dragon", getting over his fear of Summoning the other Dragons. He also watched Yuya's and Declan's Action Duel. Dennis was happy that Yuya won both Duels and was sent to the Pendulum Dimension by Ray Akaba to witness her revival as Zuzu. Dennis uses a "Performage" Deck. "Performages" are largely focused on preventing effect damage and swarming the field for Xyz Summons such as "Performage Flame Eater" and "Performage Hat Tricker" respectively. Dennis also utilises "Chaos Ancient Gear Fusion", using "Ancient Gear" monsters in his Deck and Extra Deck for Fusion Summoning "Chaos Ancient Gear Giant" as a last resort. After traveling to the Synchro Dimension, Dennis uses "Performage" Pendulum Monsters to aid in the swarming of his monsters, as well as using their effects to hinder the opponent and support his Xyz Monsters. This also gives him the capability to Xyz Summon monsters immediately after Pendulum Summoning the materials. Dennis also uses cards such as "Performage String Figure" to aid in Fusion Summon tactics, without the need for "Polymerization". Being an admirer of Yusho Sakaki, his "Performage" Deck seems to resemble that of both Yusho's and Yuya to an extent with his Xyz ace monster, "Performage Trapeze Magician" being very similar to that of Yusho's "Performapal Sky Magician". ↑ 1.0 1.1 Yu-Gi-Oh! ARC-V episode 47: "Identity Crisis"
↑ 2.0 2.1 Yu-Gi-Oh! ARC-V episode 43: "Fire And Ice"
↑ "TV Tokyo Yu-Gi-Oh! ARC-V Characters". April 5, 2015. ↑ 4.0 4.1 Yu-Gi-Oh! ARC-V episode 70: "The Gift of Grit"
↑ 5.0 5.1 Yu-Gi-Oh! ARC-V episode 112: "Hat-Trick"
↑ 6.0 6.1 Yu-Gi-Oh! ARC-V episode 75: "Shay's Revenge"
↑ Yu-Gi-Oh! 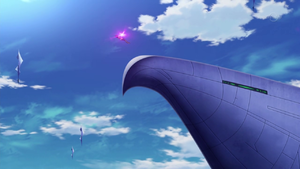 ARC-V episode 42: "Battle Fields"
↑ Yu-Gi-Oh! ARC-V episode 44: "Danger Zones"
↑ Yu-Gi-Oh! ARC-V episode 45: "Obelisk Assault"
↑ Yu-Gi-Oh! ARC-V episode 49: "Fighting for Fun"
↑ Yu-Gi-Oh! ARC-V episode 50: "Dueling Declan"
↑ Yu-Gi-Oh! ARC-V episode 53: "Parental Guidance: Part 2"
↑ Yu-Gi-Oh! ARC-V episode 63: "Fight for Freedom"
↑ Yu-Gi-Oh! ARC-V episode 76: "Plans of Attack"
↑ Yu-Gi-Oh! ARC-V episode 91: "Chain Game"
↑ 24.0 24.1 Yu-Gi-Oh! ARC-V episode 113: "Joy of Revenge"
↑ Yu-Gi-Oh! ARC-V episode 114: "All Duel Hands on Deck"
↑ Yu-Gi-Oh! ARC-V episode 143: "Amateur Hour"
↑ 27.0 27.1 Yu-Gi-Oh! ARC-V episode 144: "Showtime Showdown"
↑ Yu-Gi-Oh! 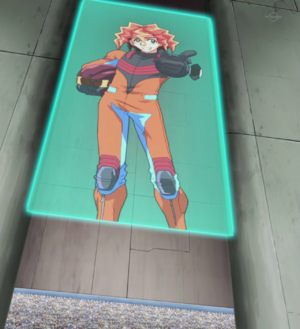 ARC-V episode 148: "That's A Wrap"
↑ 1.0 1.1 1.2 This card can be seen when he entertains the audience in episode 57. ↑ 2.0 2.1 He bribes the prison's cook with this card in episode 60. This page was last edited on 7 October 2018, at 04:06.